This paper discusses surveying procedures for measuring land areas published by Charles Davies in the 1840’s and known to Thoreau and other surveyors. Davies’ procedures are described in the context of an Excel spreadsheet and compared to Thoreau’s and Tuttle’s land area measurements of Wheeler’s Lot in 1854. Thoreau’s likely use of a pantograph for copying maps at varying scale is discussed. Thoreau’s use of a surveyor’s compass capable of recording angular measurements with greater precision than described in Davies’ tables provide an unique means for identifying surveys recorded by Thoreau. “This is the inaugural volume in the first full-scale scholarly edition of Thoreau’s correspondence in more than half a century. When completed, the edition’s three volumes will include every extant letter written or received by Thoreau–in all, almost 650 letters, roughly 150 more than in any previous edition, including some that have never before been published. Correspondence 1 contains 163 letters, ninety-six written by Thoreau and sixty-seven to him. Twenty-five are collected here for the first time; of those, fourteen have never before been published. These letters provide an intimate view of Thoreau’s path from college student to published author. At the beginning of the volume, Thoreau is a Harvard sophomore; by the end, some of his essays and poems have appeared in periodicals and he is at work on A Week on the Concord and Merrimack Rivers and Walden. The early part of the volume documents Thoreau’s friendships with college classmates and his search for work after graduation, while letters to his brother and sisters reveal warm, playful relationships among the siblings. In May 1843, Thoreau moves to Staten Island for eight months to tutor a nephew of Emerson’s. This move results in the richest period of letters in the volume: thirty-two by Thoreau and nineteen to him. From 1846 through 1848, letters about publishing and lecturing provide details about Thoreau’s first years as a professional author. As the volume closes, the most ruminative and philosophical of Thoreau’s epistolary relationships begins that with Harrison Gray Otis Blake. Thoreau’s longer letters to Blake amount to informal lectures, and in fact Blake invited a small group of friends to readings when these arrived. Robert N. Hudspeth is Research Professor of English at the Claremont Graduate University and professor emeritus of English at Redlands University. He is the editor of The Letters of Margaret Fuller and the author of Ellery Channing. I improve this the first opportunity by sending your cloak by the Accommodation Stage. The Concord Accommodation Stage made the seven hour round trip between Concord and 11 Elm Street, Boston, each day. In his A HISTORY OF THE TOWN OF CONCORD, Lemuel Shattuck wrote, “Public Stages were first run out of Boston into the country through Concord, in 1791, by Messrs. John Vose & Co. There are now (1833), on an average, 40 stages which arrive and depart weekly, employing 60 horses between Boston and Groton, and carrying about 350 passengers; 150 have passed in one day.” William Shepherd (owner of Shepherd’s Hotel on Main Street) ran a line of stages between Concord and Boston from 1817. Stages also stopped at the Middlesex Hotel. Beth Witherell’s letter to me relative to The Correspondence, Volume 2 included a question about Thoreau and surveying. I’m the head of the Princeton Edition of Thoreau’s writings, and I’m a big fan of your work on Thoreau. The surveys have much more significance than most readers and scholars of Thoreau have realized, and between your Illustrated Atlas and the Field Notes and Pat Chura’s book they have become more accessible. I wish I had been able to get to the last couple of Annual Gatherings to hear you talk and to meet you. For a long time I went every year, but in the last five or six years family matters have kept me from traveling. I’ve worked on Thoreau since 1974 and studying his manuscripts, in person and using photocopies, has given me an opportunity to see the wide range of his interests and competencies. I’ve also come to understand the interlocking relationships among the contents of the various manuscripts that are now physically separate, which you don’t have a way to think about if you have access only to published versions. For example, a (particularly full) day’s work for Thoreau might include writing up several days’ worth of notes as Journal entries, beginning a survey, reading and copying extracts from part of the Jesuit Relations, and writing a letter to the Harvard librarian accompanying a couple of books he was returning via a friend. The Journal passages would be in a MS volume of the Journal, now at the Morgan Library; the survey notes would be recorded in his Field Notes of Surveys, now at the Concord Free Public; the Jesuit Relations extracts would be in one of his MS Indian Books, now at the Morgan; and the letter might now be in the Houghton. The parts of Thoreau’s work for that day all affected one another; sometimes the cross-pollination is visible, as when he mentions a survey or the title of a book in his Journal, and sometimes it’s not. One of my goals in annotating the Journal and Thoreau’s letters is to reveal these relationships when they’re relevant, to show the cross-pollination. To see the Image of Thoreau’s plot of Wheeler’s Lot in “Thoreau’s Field Notes of Surveys” go to http://allanhschmidt01742.wordpress.com/ and scroll down to page 105.
little reliance could be placed upon it in computing areas. Southings from the Southing of the 7th course. areas & what is the present variation of the needle in Concord? Last month, in Boston, Bob Hudspeth, the editor with whom I’m working on this volume, found the record for a transaction that I think involves this parcel: On December 14, 1854, James Wetherbee Wheeler of Acton sold a tract of woodland containing 14 acres, 28.5 rods to John Fletcher and Cyrus Dole of Acton. The price was $664.50. I’d like to be able to date Tuttle’s letter, at least approximately, but I’ll have to use circumstantial evidence because the portion of the letter that survives doesn’t show a date. So my first question is whether I can reasonably assume that Thoreau’s record in his Field Notes and Tuttle’s letter and the record of the transaction are all about the same piece of land. If they are, then I think I can assume that Tuttle worked for Wheeler (“Mr. W”), who supplied him with “a very small plan of [the lot] (about 2 rods to an inch I should judge)” which someone had “cast . . . up making 14 A 22 rods.” So that’s what Wheeler thinks the area is. In his letter Tuttle notes, “The plan was so small (& so unskillfully drawn) that I told Mr. W that very little reliance could be placed upon it in computing areas.” (I don’t think Tuttle went out and measured the lot–he mentions using traverse tables, which I think means that he used the data Wheeler gave him. Is that right?) Thoreau is working for Fletcher, who has furnished him with “minutes” that Thoreau has used to make his own calculations. Based on that data, Thoreau calculates the area to be smaller than Wheeler thinks–13 acres 112 rods. Tuttle wants to know how Thoreau arrived at his result. Before December 14, 1854, Wheeler engages Tuttle to calculate the area of the lot based on a small plan. On December 14, Fletcher and Dole purchase the lot from Wheeler. Between December 14 and December 22, Fletcher engages Thoreau to recalculate the area of the lot. On December 22, Thoreau does that recalculation and records the result in his Field Notes. After December 22, either Thoreau or Fletcher communicates Thoreau’s figures to Tuttle and Tuttle writes to explain how he made his calculations and to ask Thoreau how he did his. Following this sequence, I’d date Tuttle’s letter “After December 22, 1854”. Does that seem supportable to you? So that’s one set of issues this letter raises. Another is that Tuttle’s letter is packed with the vocabulary of surveying, which Thoreau obviously understood but which baffles me and will baffle most of our readers. I’ve found definitions of traverse tables and latitude and departure and chains and rods, but they don’t help me to understand the overall meaning of Tuttle’s letter. I think the best way to explain that would be to provide a brief explanation of what Tuttle is describing to Thoreau and asking Thoreau about. Could you write such an explanation to be used an annotation for this letter? I’m sorry to say that I can’t offer you anything but credit for this work (I can send you a copy of Correspondence 1 now, and make sure you get Correspondence 2 and 3, which will save you several hundred dollars if you were planning to buy the books, but it’s not the same as a consultant’s fee, I know). You would be named as the author in the annotation itself, which will follow the letter, and you’d be listed in the Acknowledgments for Correspondence 2. Thanks very much for persisting to the end of this long message. Whether it’s possible for you to respond to my questions or not, I do look forward to meeting you sometime. Question: What is Tuttle describing to Thoreau and asking Thoreau concerning Wheeler’s Lot? Answer: Tuttle is describing two different procedures he had used to measure the area of Wheeler’s lot and asking Thoreau’s opinion as well as Thoreau’s experience concerning a related issue of compass correction for magnetic variation in Concord. Area measurement of a land parcel was a common statistic provided by Thoreau for the lots that he surveyed from 1837-1860. Many of the land parcels were described as “woodlots”. An area measurement could be used to calculate the amount firewood or building lumber and therefore dollar value that could be expected from a woodlot prior to its being cut. There were two commonly used methods for computing land areas, given a map of known scale. 1. Divide the existing map of land lots into geometric units (e.g. squares and triangles) and then compute the area of each lot and sum their total area. 2. Noting the bearings and distances for each lot originally recorded with compass and chain, use rules of geometry and traverse tables to compute the area enclosed within the map perimeter. 1st. Inaccuracy of the surveyor’s field observations when recording bearings and distances. 2nd. Local attractions or the derangement which a compass needle experiences when brought into the vicinity of iron-ore beds, or any ferruginous substances. To guard against these sources of error, reverse bearing should be taken at every station: if this and the forward bearing are of the same value, the work is probably right; but if they differ considerably, they should both be taken again. Differences between measurements taken in each direction also may be used to estimate “balancing” corrections. The Traverse tables that are included in Davies book, show the latitude (N-S) and departure (E-W) corresponding to bearings for each survey line segment expressed in degrees and quarters of a degree from 0 to 90°, and for every course from 1 to 100, computed to two decimal places. By use of these tables the latitude (Y- coordinate) and departure (X-coordinate) of each course segment may be computed. Davies describes how given a surveyor’s field measurements describing the straight line segments defining the perimeter of a property boundary, it also is possible to compute the area of the property in question and also create a graphic x-y coordinate plot of its perimeter. 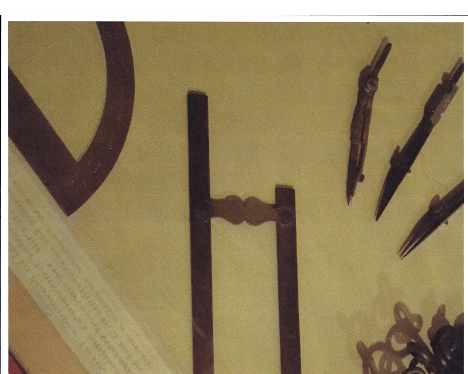 Thoreau owned such devices currently on display in the Concord museum and shown on their website. http://www.concordcolleection.org/ then do a word search in the Thoreau collection for “compass” and you will see Thoreau’s pantograph. The plan was so small (& so unskillfully drawn) that I told Mr. W that very little reliance could be placed upon it in computing areas. the area to be 13a 109,57r. you found the Lat & Dep of each course. What is your general method of computing areas? (i.e. Do you generally use plotting of geometric units or the Compass and chain measurements? & What is the present variation of the needle in Concord? The question concerning “the present variation of the needle in Concord” refers to difference between True North and Magnetic North that Thoreau typically included on the plots he made of his Concord area surveys, a process which Thoreau described in detail in his Field Notes of Land Surveys on Feb 7, 1851 on page 38. For example Thoreau reported a Variation = 10’1/8W on his map of Oct. 3, 1853. Charles Davies in the 1839 edition of his book points out that heat and cold affect the magnetic needle and that the same needle will at the same place indicate different line at different times of the day. The magnetic needle will continue to recede from the meridian as the day advances until about the time of highest temperature, when it will begin to return and at evening will make the same line as in the morning. This change is called the diurnal variation and varies during the summer season from one fourth to one-fifth of a degree. Traverse networks involved placing the survey stations along a line or path of travel, and then using the previously surveyed points as a base for observing the next point. Fletcher’s question to Thoreau concerning methods for computing areas is indeed interesting, and two different methods for dong so are described in Davie’s book. Thoreau’s had used gridded data for measuring the area of Isaac Watts’ Woodlot Nov. 1849. Davies describes the use of traverse tables to estimate the area of a land parcel including corrections for surveyor error in the vector data plus procedures for traversing the survey perimeter as an error check. Column A numbers each survey station as a separate row in the table. 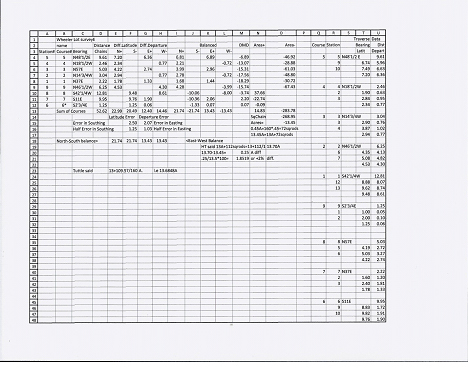 Traverse Table Data is shown in columns Q through U taken from Davies Handbook. In doing so, we have distributed the differences between the outliers in the values for each course. For this purpose a meridian line is selected that passes through the most westerly station of the survey. Next we look for inconsistency in the data values by checking for equivalence when tracing the values when we attempt to link the values in a clockwise order. The linking process involves computing an estimated next value based upon the current, last, and next value in the sequence which should result in a complete return to the initial value in the chain if all entries are consistent. 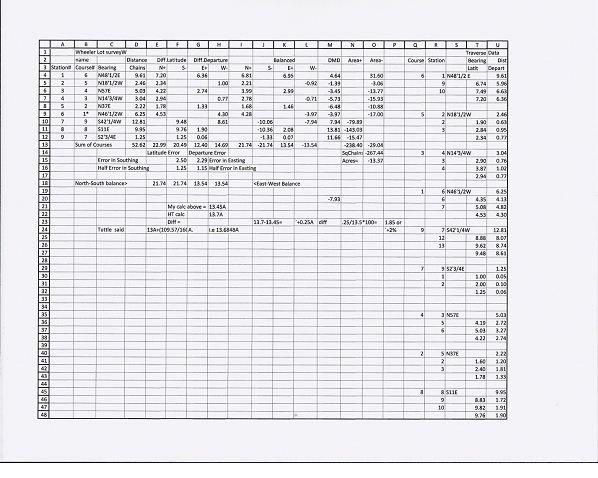 Due to the numerous values derived from various tables and calculations this is an essential step for quality control. It also is very time consuming to perform manually. The DMD of the last course should be equal to the departure of that course. Note that the DMD value and the departure value for last course #9 is = 3.97 and thereby closing the loop. A verification of the work is therefore obtained by comparing the DMD with the departure of the course. Next we apply Davies rules for computing the area given the DMD of each course. Charles Davies in his book “Elements of Surveying & Navigation” (1846) describes a procedure for calculating land area on pages 110-114 . 1. Multiply the DMD of each course by its northing or southing, observing that like signs in the multiplicand and multiplier give plus in the product and unlike signs give minus in the product. 2. Place all the products that have a plus sign in one column and all the products that have a minus sign in another. 3. Add up the columns separately and take the difference: this difference will be double the area of the land. Data for Wheeler’s Lot using Davie’s traverse tables results in a value = 267.44 Sq. Chains, = 13.37 A.
Thoreau reported 13A+112 Sq. Rods= 13.7A.
. Tuttle’s estimate was 13+109.57/160 i.e. 13.6848 A. or 13.69A, almost same as Thoreau. On December 14, 1854, James Wetherbee Wheeler of Acton sold a tract of woodland reportedly containing 14.18A to John Fletcher and Cyrus Dole of Acton. Who created the survey “minutes” and rough sketch describing Wheeler’s Lot before it was sold to Fletcher? Who provided the area measurement recorded with the lot sold by Wheeler to Fletcher? I suspect Tuttle initially surveyed the nine points needed to establish the minutes and chain measurements for Wetherbee Wheeler. From that Tuttle would have been able to create a crude sketch from which he estimated the total area by use of a grid to initially compute the area for Wheeler as 14.14A. That data could have been used as a basis for recording and selling Wheeler’s lot to Fletcher. After Fetcher purchased the land, he may have asked for a second more accurate opinion about the lot area from Tuttle. We do not know when Tuttle was initially contacted by Wheeler but it appears to be prior to Tuttle’s letter to Thoreau. Tuttle initially computed the area from a grid giving 14.13A. Subsequently Tuttle computed the area using traverse table area to be 13.69A. Tuttle clearly had an interest and experience in estimating the area of Wheeler’s lot by a variety of methods. Shortly thereafter Thoreau estimated the area to be 13.70A. Tuttle provided an estimate of 13.69A.using traverse table data, and he asked Thoreau what procedure he used to compute a value of 13.70A. Tuttle’s letter suggests he was aware of Thoreau’s interest in Wheeler’s lot area and seeking to compare results and procedures. Thoreau implies that his estimate was calculated for Fletcher “from minutes furnished by him”, It is not known how Fletcher initially had obtained the minutes, possibly from Tuttle. If Tuttle worked for Wheeler before he sold the property Tuttle may have computed the area and the minutes that appear on the deed that Fletcher acquired at the time of sale. 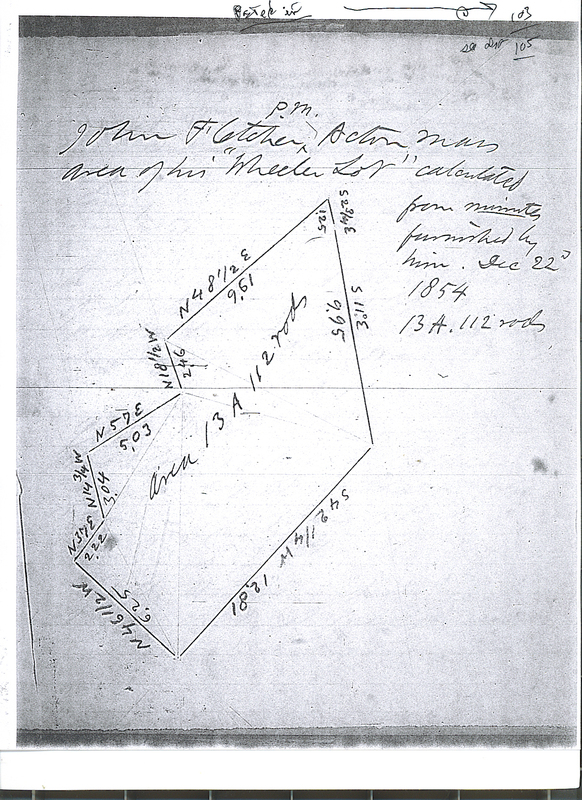 After the sale, Fletcher hired Tuttle to measure the property with greater accuracy at which time Tuttle computed the minutes from a field survey and computed the area. Fletcher then asked Thoreau for his opinion and gave Thoreau the minutes computed by Tuttle. Tuttle was aware of Davies’ procedures for measuring land. Thoreau’s measurements always appear to have had at least one measurement finer than ¼ degree so they could not be used with Davies Traverse tables for measuring land areas. Thoreau’s measurements were to the precision of his instrument, not to the less precise requirements of Davies’ Traverse tables with angles no finer than ¼ degree. Therefore, Thoreau’s field survey entry of Fletcher’s “wheeler’s Lot” for 12/22/54 was probably a description of Tuttle’s original data “from minutes furnished by him” i.e. furnished by Tuttle to Fletcher who furnished them to Thoreau. Thoreau was aware of Davies procedures and presumably could have applied them to compute the lot area with the coordinates he was given rather than coordinates he (Thoreau) had measured in the field. I doubt that the coordinates shown were measured by Thoreau. Thoreau’s measurement of Fletcher’s lot by use of minutes is the only example I have found of a map attributed to Thoreau that would qualify for use of Davies traverse tables because all of Thoreau’s other maps included at least one coordinate measurement finer than ¼ degree increment, e.g. 1/8th, 3/8th, 5/8th, or 7/8th of a degree. Davie traverse data tables included coordinates only in ¼ degree increments. Although he obviously did not use Davies traverse tables, Thoreau may have plotted the area using a fine grid. Tuttle’s letter to Thoreau indicates that Tuttle used Davie’s traverse table data but we cannot tell whether Thoreau used traverse table data or merely plotted a fine grid to estimate the Fletcher’s lot area. That is the question being asked of Thoreau by Tuttle. If Thoreau were to use Davie’s traverse tables he would have needed to extrapolate values from the existing tables to be compatible with his measurements that included 1/8 degree values. Or Thoreau would have had to compute the traverse table values in a manner with which I am unfamiliar. Thoreau and Tuttle worked jointly on one or more projects involving work by Thoreau in May 1859 and by Tuttle five years later in 1864. The map was likely obtained from Tuttle and included in the Concord Public Library collection of Thoreau’s maps when they were assembled by his sister after Thoreau’s passing. Thank Beth Witherell for suggesting and supporting this project. Thank also Adrienne Donohue, Concord Museum Registrar & Collections Manager, for her assistance. Thank the concord Free Public Library for providing space, equipment and access to Thoreau’s records.